The 35th annual Boston Ski and Snowboard Expo was an extravaganza of colorful outerwear, marvelous exhibits, and exciting events like the Flippenout trampoline team sponsored by the NFL and Killington. An exciting kick-off to the snow season for New Englanders, the four-day event also featured a variety of amazing deals, from equipment to resort tickets and vacation discounts. It also provided a glimpse into new trends and technologies aimed at enhancing the ski and snowboard experience. Kelly Davis, SnowSports Industries America (SIA) research director, presented an overview of the trends that are currently being seen at an SIA breakfast for journalists. Skis that carve are trending and there’s a “backing away from 120 mm wide waists on groomers,” she noted. There’s a widening variety of snowboard shapes, and lighter skis and boots are trending along with a return to wool — for base layers and socks, Davis said. The goggle trend features an array of new and easy lens-switch systems, including a Giro that has rare-earth magnets. Goggles can cost anywhere from $20 to $600-plus. The simple ones don’t have replacement lenses and the more costly feature higher grade lenses and come with two or more lenses while others also feature easy switch mechanisms to make a lens change possible without removing one’s gloves! There’s even a goggle with a heat feature to cure the fogging problem. But the truly big trend is smart goggles. Davis predicts everyone will soon be using them! Pokemon Go may give way to Chase the Yeti through reality goggles, Davis quipped. Smart goggles incorporate a display within the goggle that allows users to access all kinds of information, from who’s calling on their cell (still tucked in a pocket or backpack) to their own ski data (speed, mileage, vert, etc.) to GPS and resort maps. Goggles like Oakley’s Airwave models essentially incorporate a powerful wearable computer with sensors and networking capabilities. The really advanced models will even allow you to use apps that can control Go Pro cameras. To be sure your cell phone doesn’t die on you, consider the Therma-Phone Protector, which was the brainstorm of Vermonters Sherri Hermanowski and Yvette Randolph. CEO James Hermanowski said the patent-pending product was designed to ensure your mobile phone works no matter the extreme temperatures you encounter in your travels. Hermanowski noted that most cell phones are made to operate in a specific temperature range so knowing that was impetus for the protector. It’s a soft, compact, flexible phone case with many layers designed to keep your phone operating in cold or hot temperatures — comes with heat packets to insert for extreme cold. The protectors are handcrafted in Vermont, using materials sourced locally and in the U.S., he said. (Therma-phone.com). The Snurfer and Vew-Do balance boards were also among the Vermont products shown off at the 2016 Expo. Dave Schmidt said they sold both the balance boards and Snurfers at their booth and were “busy from the time the show opened on Thursday to its Sunday closing. The show for us was extremely successful,” he said. Many people shared stories about having a Snurfer as a youngster — it’s been around for 50 years but was revived by the Manchester company just a few years ago — or a balance board, which Vew-Do has been producing since 1990. Unlike the original bongo board, the Vew-Do has multi-directional feature that makes it a good tool for snowboarders. The Burlington-based Powe.Snowboards were also a hit at the show. Powe’s econ-friendly snowboards have a new “Cowe? Snowboard” model this year. It pays tribute to Camel’s Hump and Betsey the chocolate milk cow in another colorful, fun design — something the boards are known for as well as using green materials like bamboo, poplar, hemp, and basalt. Waitsfield-based Obermeyer rep Tim King displayed mannequins showing the trend of bright and bold colors with contrast pipings as well as Obermeyer’s “grow” feature in the print teen pants that co-ordinate with a colorful jacket. Ragged Mountain, N.H., is offering three free lessons with free lifts and rental equipment included so as to make “learning to ski affordable,” Ragged’s Ben Hall noted. This effort joins the low-cost learn-to programs from Elan, Rossignol, and Burton that originated with Killington’s Elan Discovery program several years ago. The 3- or 4-day programs (lifts, lessons, and rental equipment) reward first-timers with free equipment and/or season passes upon lesson completions, depending on which ski area is offering the program. This has become a hot nationwide trend thanks to Killington’s successful and award winning programs that bring first-timers into skiing and riding and keep them coming back! 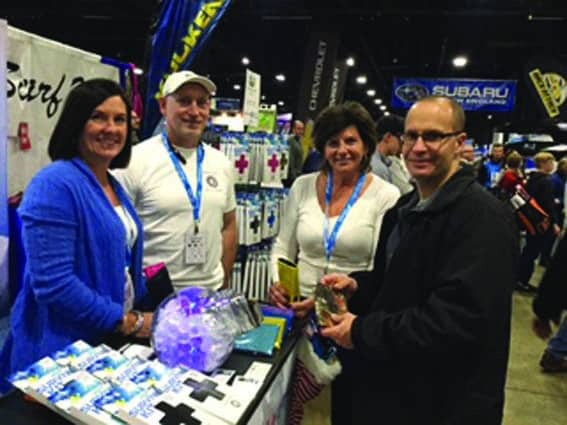 Yvette Randolph, James and Sherri Hermanowski show their new Therma-Phone Protector to Boston Ski and Snowboard Expo attendee last week.